With the farming sector looking up, many farmers are seeking to upgrade their tractors or add to their fleet. Case IH has just made it easier than ever to choose a tractor from the versatile Puma range by offering an unbeatable low 4.95 per cent fixed finance rate. Case IH Marketing Manager, Stuart Brown says that while the current economy may look bright for many producers, which will allow them to upgrade their farm equipment, farmers don’t necessarily want to tie up their cash flow in the present moment. 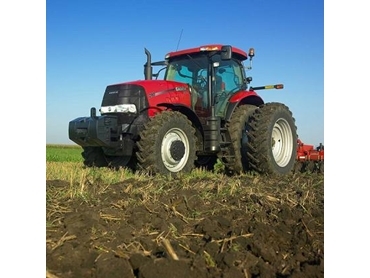 With a view to enabling their customers to get more productive sooner than later by buying a new Puma tractor, Case IH is offering a low rate with excellent terms. The 4.95 per cent fixed finance rate on Puma models is for farmers who wish to make five annual repayments. Case IH offers lower rates for farmers who prefer to make monthly payments. The deposit is only 30 per cent of the RRP and any dealer discount negotiated becomes part of the deposit, according to Stuart. New tractor financing through the dealership is convenient and simple. Case IH’s Puma range of tractors combines broadacre capability with row crop power to create a versatile, tough workhorse that can handle just about any on-farm task. With five models ranging from 127 hp to 224 hp, the top-of-the-range Puma 225 comes with Continuously Variable Transmission (CVT) as standard. Stuart says that the Puma range is ideal for use in hay, dairy, broadacre and cane haulage operations.